This song of the Lamb, in Revelation 5, is not a dirge, nor is it a lament. Instead, it is a victory song which heralds the triumph of Christ (Rev. 5:5) - a triumph that was established for His sheep from before the foundation of the world (Revelation 13:8). Someday in glory, we will sing this song of victory to our precious Savior who shed His blood for our sin, therefore, in a way you can think of All Nations Under God as a form of choir rehearsal for that eternal choral. The book’s appendix contains a survey of some of the most hotly contested verses that relate to the question of the atonement. These verses are carefully examined, using diagrammatical analysis, so that the reader can graphically see the clear meaning of such texts. 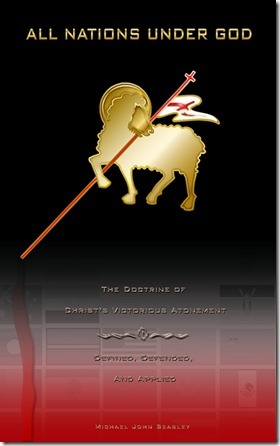 From the book cover: All Nations Under God, The Doctrine of Christ's Victorious Atonement: Defined, Defended and Applied. The church of Jesus Christ presently faces many battles and challenges, for the enemies of the Gospel continue relentlessly to oppose and contest the central message of the Scriptures: Christ and Him crucified. But there is another battle that has been gaining momentum - this one is arising from within the ranks of the visible church. It is a battle that is draining the church of her vitality and joy. Worse than that, it is a battle that is robbing Christ of His glory as the victorious Lamb of God. But the church must refute such contention and reclaim the joy, motivation and power of the Gospel ministry by looking intently at the One who calls Himself the eternal Victor: The Lord Jesus Christ. All Nations Under God looks to restore the true hope and joy of the church by reclaiming the Biblical vision of the Lamb of God who was slain for our sin.